Floyd Mayweather claimed his 47th win against Marcos Maidana at the MGM Grand in Las Vegas on Saturday night. 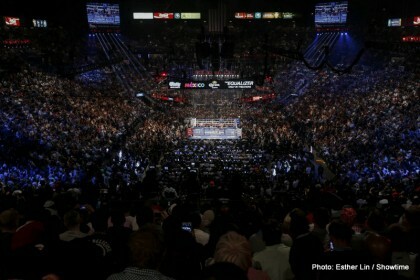 “Mayhem” was a massive event just like all Floyd Mayweather’s fights have become. It’s not just a fight but an event, and a global event at that. Stars from the world of sports, film, music and fashion fly into Las Vegas just to watch Floyd fight. Fight week started with fighter arrivals on Tuesday, Floyd had his final press conference on Wednesday. Thursday was the undercard press conference, with fan workouts and autograph signing, and a screening at Bleacher’s madhouse for the fans in the evening. Friday was the weigh in, where Rick Ross took the stage to entertain the 10,000 strong crowd before Floyd and Marcos Maidana took centre stage. I was seated next to Badou Jack and Ishe Smith, just behind Danny Garcia and Adrien Broner. I was surrounded by world champions and boxing legends. Danny Jacobs, Peter Quillen, Evander Holyfield and Paul Williams, who is now disabled after a motorcycle crash, and boxing legends Erik Morales and Sergio Martinez. Who would have thought that I’d be rubbing shoulders with these guys who now know me by name, and show me respect. That makes me so proud. “Work so hard that your idols become your rivals” comes to mind. Rival, the Canadian based boxing equipment provider, had a shop opening in Las Vegas. I headed down there with Badou and former world champion, Lou DeValle. Sugar Ray Leonard, Lennox Lewis, Hasim Rahman, Roy Jones, Jean Pascal, Eddie Mustafa Muhammad all turned up for the opening. Great company once again. On Saturday morning I went to the Boxing Fan Expo to sign autographs and take photos with the fans. The event was jam packed with boxing legends and champions; Sugar Ray Leonard, Mike Tyson, Evander Holifield, Roy Jones Junior, to name but a few of them. At 4:30pm I was at ringside to do a live interview with Steve Illis for BoxNation who are televising the Mayhem card in the UK. I was asked for my views and predictions for the fight – I believed Floyd could get a knockout win. I was also asked what it was like to be signed up by Floyd Mayweather. I’m a kid from a neglected part of London where crime is sky high, unemployment numbers keep rising and the aspirations of the tenants are gutter high. I’m not supposed to be in Las Vegas. I’m not supposed to be with Floyd Mayweather. My life, my journey has hopefully inspired kids from similar backgrounds to myself to chase their own dreams. Some people criticise me for achieving this. Some people are just never happy regardless of what you achieve. Successful and important people from sports, media, music, fashion, business and politics have commended me on my journey to date, and that is pleasing. It’s easy to be just a statistic from where I’m from but I have the huge pleasure and privilege of having an employer by the name of Floyd Mayweather. Mike Tyson inspired me to become a boxer, watching him on TV as a five year old. Roy Jones Junior astonished me with his ‘special effects’ talents as a teenager. Floyd Mayweather showed me that with hard work and dedication anything is possible. Floyd’s motto has gotten me to be where I am in life. I’m not a champion yet, but no one ever believed I would even be a contender. I appreciate every day that I spend in Las Vegas under the guidance of Floyd. I won’t hear a bad word said about him. This is a man who gets nothing from seeing me do well. He’s told me if I need anything just ask. He gave me my highest grossing fight purse and put me on the biggest PPV boxing show ever. I see day in day out during camp the lives he touches and the people in need he helps. Everyone I know who knows him values him as a person, it’s people who don’t know him that make ill-judged comments regarding him. You can’t please everyone but everyone who knows him, appreciates him. Floyd mentioned both Manny Paciquao and Amir Khan in his post fight press conference. Maybe one of them will fight him next May or September. Mayweather promotions got its second world champion on Floyd’s “Mayhem” card. Mickey Bey beat the number one lightweight champion. Miguel Vasquez held the title for five years and had only lost to Saul Alvarez and Timothy Bradley. That was a great win and I’m proud of Mickey. I finished fight week with Floyd at his mothers’ house. Celebrities, family and friends attended. Great atmosphere with good people. Another Floyd Mayweather training camp is over. In 12 months’ time he’ll be having his last fight. He will be missed when he’s gone. There’s never been an athlete to do the numbers or make the amount of money he has. They criticize you when you’re active but they will miss you when you are gone.